One of the world’s legendary motor racing circuits, Australia’s Mount Panorama (aka Bathurst) is a throwback to an era when most motorsports events were staged on public roads. 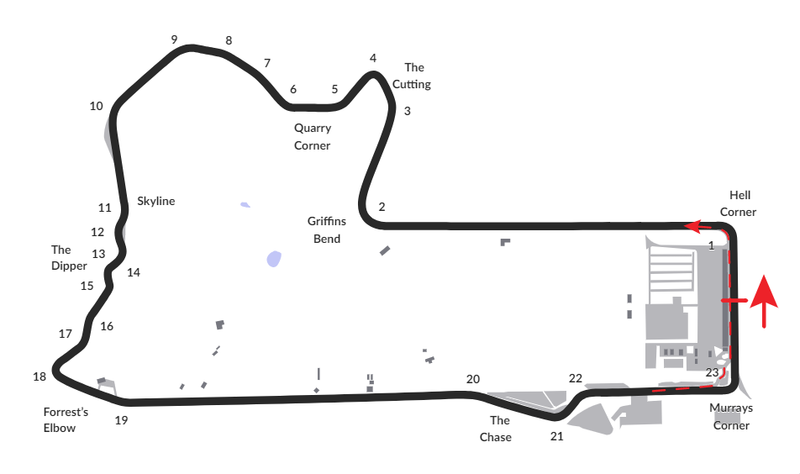 Located outside of Bathurst, New South Wales, the 4 mile (6.213 km) Mount Panorama Circuit serves as public roadways when not being used for racing: indeed many adjacent business and residential properties can only be accessed using the roads comprising the circuit. The circuit embodies many of the characteristics of history’s great open road courses, including steep grades and substantial elevation changes (there is a 570 ft/174 meter vertical difference between its high and low points), flowing sequences of challenging, distinctively-named bends like Hell Corner, The Dipper and Forrest’s Elbow, and dramatic vistas for spectators. Mount Panorama was originally carved out of the hills around Bathurst in the 1930s. Through a national employment relief effort during The Depression, local and federal government developed what had been a dirt-track/tourist drive into a race track. Mount Panorama’s first event was staged in April 1938 and – apart from the years during World War II – the circuit has been in regular use ever since. Historically, the race track has been used for a wide variety of racing categories, including everything from open-wheel racers to motorcycles. In recent years Mount Panorama has been best known as home of the Bathurst 12 Hour sports car race and the Bathurst 1000, a signature event in the V8 Supercar Series.